We are doing a lot of vintage restorations on acoustic as well as on electric guitars, so we have the experience, the tools and of course a good stock of original spare parts of all kinds. For a good restoration it´s essential to know how these guitars looked when they were new and to not overdo it to keep the used look and the mojo of old wood alive. We are also offering a vintage correct pickup rewinding service. We are working for collectors, stores, museums, other luthiers and of course insurance companies. 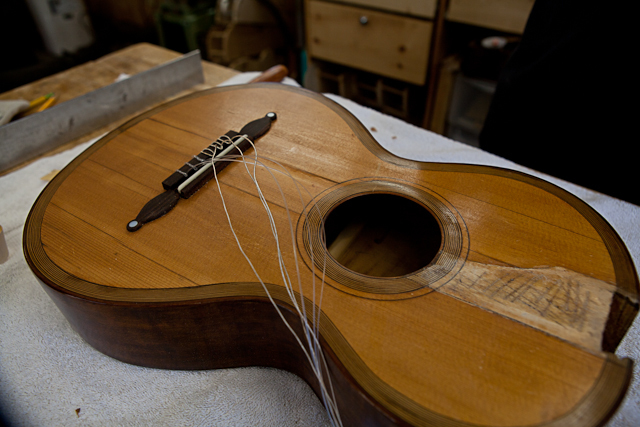 If you need a survey regarding value and authenticity of a vintage instrument we can help you, e.g. when you are planning to buy a vintage guitar or when you want to insure one. There are many fakes around and not everything that is old is also valuable. So better ask before you buy. Same for CITES certifications regarding protected woods, ivory, tortoise etc. – we have the know-how to sail you through this safely.